Imagine escaping on a vacation getaway to a real log cabin that is both quiet and secluded yet only 1/2 mile from Hill City's Main Street. Our property is in the "Heart of the Black Hills" so we are centrally located to Mt. Rushmore, Crazy Horse, Deadwood, Wind Cave, Jewel Cave, Deerfield Lake, and many other Black Hills attractions. A Cabin in the Woods...We offer six intimate real log cabins for nightly or weekly rental year-round. Our cabins circle a peaceful meadow and are placed well back from the road. Each cabin features a full kitchen with range, refrigerator, microwave, coffee maker, cookware, dinnerware, and utensils. Each also has a gas fireplace, gas barbeque, an old-fashioned claw foot bathtub or slate-lined rock shower, towels, bedding, a gas barbeque, and a porch with breathtaking views. Five have lofts and comfortably sleep up to four people. Our sixth, which has a view of Harney Peak, is a two bedroom and can sleep up to eight. The cabins are placed a short distance apart to afford peace and privacy. A Visit To Grandma’s: In addition to our six log cabins, we also offer accommodations in a unique and historical ranch house built in 1914. No detail was overlooked in the restoration of this charming cottage, backed by quaking aspen. Grandma’s Ranch House has two-bedrooms and features a full bath with period stylings such as a claw foot “slipper” bathtub and vanity with vessel bowl sink. It also has a fully-equipped kitchen with modern electric stove and refrigerator, a small antique farm table, wood-burning cook stove, and an old-fashioned hand pump. Although the latter two appliances are non-functioning, they serve as a reminder of the early 1900s. Grandma's Ranch House is also distinctive in that the living room features a wood-burning stove, it is situated next to Newton Fork Creek, and has its own private yard. 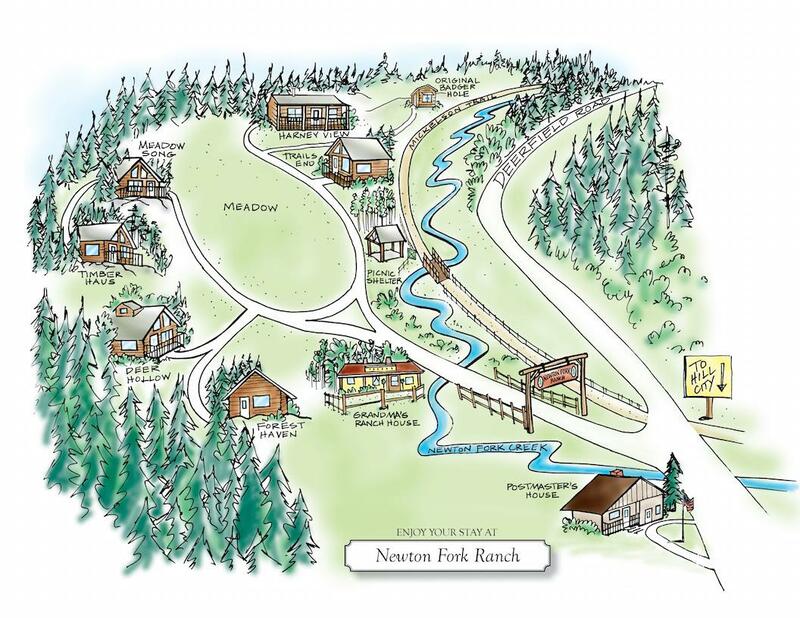 Newton Fork Ranch will become your “home away from home;” your peaceful oasis from a world filled with time constraints and non-stop activity. Our fully furnished and well-equipped log cabins will afford you a welcome respite from a hectic life. An afternoon sitting on the deck watching wildlife or an evening spent by a warm fire will transport you to a far simpler and more tranquil time. Cabin amenities include: full kitchen with refrigerator/freezer, electric cooking range with oven, microwave; dishes, utensils, cookware, and coffee-maker; linens; towels; hair dryer; AM/FM radio and CD player; gas fireplace; gas barbeque; and air conditioning provided in the summer months. Newton Fork Ranch will become your “home away from home,” a peaceful oasis from a world filled with time constraints and non-stop activity. Our fully furnished and well-equipped log cabins will afford you a welcome respite from a hectic life. An afternoon sitting on the deck watching wildlife or an evening spent by a warm fire will transport you to a far simpler and more tranquil time. View a complete map of all our cabin locations. Note: All prices listed are per day for two guests in one of our loft cabins. Each additional person, 10 years or older, is $15 per day. Children 9 & under are free. All prices quoted are before tax. Please also note that we do not allow smoking in our cabins.